Each year for almost 45 years, our family worked a jigsaw puzzle. I loved those times and eagerly promoted the tradition by purchasing a new puzzle. Yesterday, my day off, I once again got out the new puzzle I’d bought and began sorting the pieces. The progress is a lot slower than in previous years when five of us gathered around the table to casually do the work of fitting the lines and colors into their alotted slots. This year, as I’ve worked alone, I’ve been able to realize why our family loved The Christmas Puzzle so much. We are a family of A personalities. Frank, the head of the household, was AAA. Therefore, every event progressed into a super personal competition. Christmas was an especially trying AAA event. But gathered around that silent but intriguing mass of unorganized pieces, we were all equal. No one excelled. Yet, even the youngest child was competent, valued and needed. We waltzed in and out of the room during the day and evenings, drawn by the table. We each worked our part without pressure, anger or expectation. Everyone rejoiced when the other excelled because we knew that each piece neatly fitted into the puzzle made the portion we were working on easier to complete. Only at the end when all the children competed to see who would put the last piece into the puzzle was there real competition. All the siblings came to value that last piece; and they each hid an indiviudal piece so that they would be able to put into the puzzle that last prize. It was a game their super competitive father easily let them win. 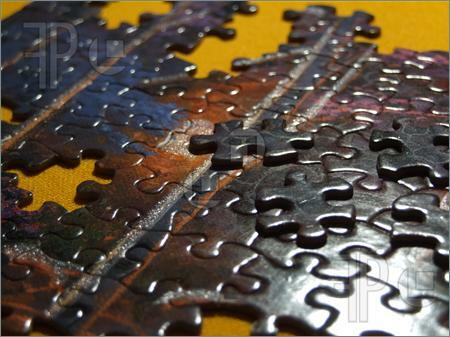 Often the jigsaw puzzle is used to explain the Christian life. Often, we learn about the mysteries of life examining the lessons we learn from completing the puzzle. For me The Puzzle was never a teaching tool. It is a pleasant memory of how people should act and react to each other. Helping, rejoicing in achievement and delighting in the pleasant company of each other. 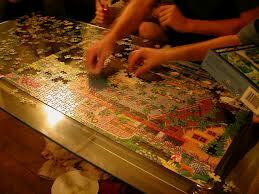 Often, as a pastor, minster, helper, coach or mentor, the joy of The Puzzle escapes me. Drawn by the need of the moment and the hurts of the past, my heart wants to fix people, especially our members who are mentally challenged. However, usually it isn’t in the act of teaching that the greatest lessons are learned. 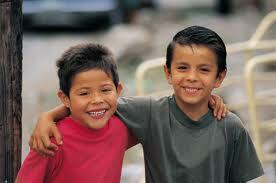 It is in delighting in each other and valuing the person that lessons are best transferred. Through Jesus’ sacrifice, God’s grace is given freely, openly and without any pressure to deserve the gift. In fact, we cannot ever obtain that most valuable gift of life eternal. Grace is God’s way of eliminating competition and delighting in ME, not my achievements. My prayer, as I’ve worked the puzzle alone this year has been that God will work the Puzzle Grace I’ve seen over the years into every part of my life.